Find fresh, fast and sustainable seafood at Slapfish. 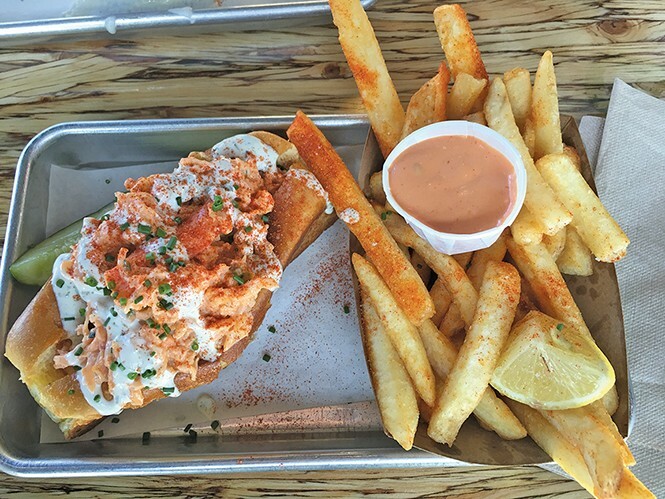 Sandy's Slapfish restaurant in is a self-described "modern seafood shack." It's modern, yes, but is it a shack? Nope. At least, the new fast-casual eatery doesn't resemble any shack I've ever seen. The idea plays off of funky seafood huts you'd find in SoCal or Mexico, with fresh fish tacos, ceviche, burritos and such. This restaurant offers those eats, but without the funk—it's shiny, contemporary and spotless. Given the dearth of seafood restaurants along the Wasatch Front—particularly low- and mid-priced ones—I was keen to visit. It's a step-up-to-the-counter affair, where you place your order, are given a number, and an employee brings the meal to your table. Signature menu items are sandwiches and rolls served with natural-cut fries that mostly run in the $7-$16 range. Think of it as the Chipotle of seafood. One feature that attracted me to this place is their commitment to serving only sustainable seafood, which is certified by the Marine Stewardship Council—an organization that keeps scientific tabs on whether seafood stocks are increasing or decreasing. Chef/Owner Andrew Gruel has built his business over six years, from a single food truck to a rapidly growing franchise with locations in eight states, plus London and South Korea. The menu describes the ultimate fish taco ($7) as "two-handed." Apt, given you'll need to wrestle this beast into your mouth. It's a ginormous grilled tortilla packed to the brim with your choice of grilled or fried hoki (aka blue grenadier, whiptail or blue hake) and topped with crispy shredded cabbage, pickled onion, fresh cilantro, a lemon wedge and the house Awesome Sauce, a smoky and creamy chile sauce. It's a helluva deal for the price. You can also try the epic fish burrito ($10), which, in addition to the aforementioned, includes guacamole, seasoned rice, tomato and black beans. There's a smaller street taco ($4), as well. A cup of New England clam chowder ($4) was awfully good, but a bit skimpy clam-wise. With large chunks of red potatoes and crispy bacon pieces in a luscious, creamy chowder, it was quite pleasing. For $3 more, you can enjoy an order of fries smothered in it. There's a south-of-the-border appeal to the fresh shrimp ceviche ($7)—shrimp marinated in lime, cucumber and tomato served with tortilla chips—as well as the lobster taquitos (two for $6.50). Since the market-priced traditional lobster roll was a bit steep at $25, I opted instead for the lobster grinder ($15). Stuffed into a toasted split-top butter roll was a generous heap of chilled shrimp and lobster salad garnished with minced chives. The shellfish mix was deliciously spicy, and I found I didn't need any hot sauce to kick things up a notch. What I did need, was a knife and fork. Prepare to get messy here. At the most traditional end of the seafood spectrum are the fish and chips ($9)—battered and deep-fried whitefish served atop a bed of fries with tartar sauce made from scratch. It's also available as a Dagwood-style sandwich ($9). The least traditional menu offering has to be the surf-and-turf lobster burger ($16), the only item that held no appeal for me. It's a griddled beef patty with cheese, caramelized onions and—wait for it—lobster. Call me crazy, but I like surf and turf, not surf on turf. That one misstep notwithstanding, there's a lot to love about Slapfish. I left the joint feeling slap happy.